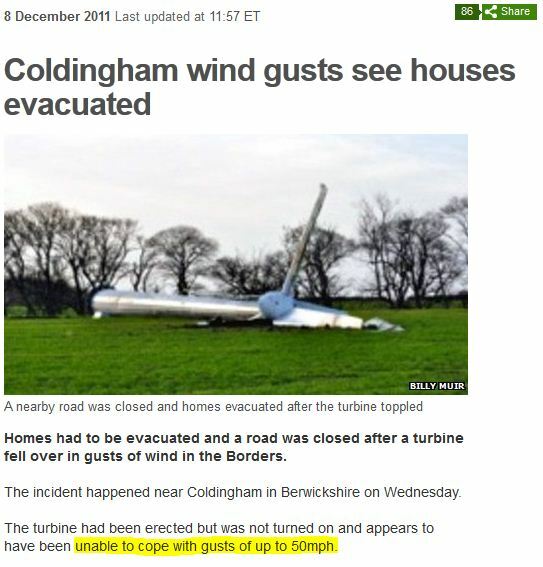 Windsplode in Scotland – plus some turbines can't handle 50mph | Watts Up With That? I wonder what the incident frequency is for wind turbine fires versus say coal, hydro, or nuclear plants? Mr McMahon, who captured the spectacular fire in photos, added: “I didn’t hear any explosion or anything, but my wife shouted for me to come down and see the fire. “There are around 13 or 15 wind turbines in the farm above Ardrossan. They were all off today because of the high winds, so something has obviously shorted out and gone on fire. Can all of those damn bird-slicers do the same? And then, please fall over and decompose rapidly. Obviously global warming caused this fire, something both warmists or a skeptic could probably agree on. For the skeptic the windmill would probably not have been there except for global warming and for the warmists GW caused the high winds. An ideal photo to commemerate the current Durban jamboree. The crashing and burning of climatology. Some of those things are next to roads, didnt a smaller one blow up in a school? But let a nuclear reactor facility develop a leak in a men’s room urinal or some other non-essential process and watch the enviros come out of the ground to protest the risk. Gas plants occasionally have explosions during construction of the gas connection, but coal plants are a long since mature technology and don’t involve any explosive materials. This wind turbine is an odd failure. The only reason I can think of why it would fail during a storm is from an overspeed condition overheating the transmission or overheating of the brake, but they say that the turbine was stopped to avoid this. And usually mechanical failures result in overspeed failures like the blades spinning out of control and flying to pieces. I guess it could be something like an unsecured electrical cable rubbing it’s insulation off because of the nacelle moving in the wind, but the backfeed protection should have prevented it from turning into a fire. So this is the “wind energy” equivalent of the “China Syndrome” ? Wind power. No wind, no good. Too much wind, no good. Need power? Hope for breezes. On a positive note, they make a good cigar lighter. In March 2011 the John Muir Trust, a UK wild land conservation group, put out a report “Analysis of UK wind Power Generation” which instead of the generalised data published by the wind power industry broke the performance of wind power down to the real actual power generation figures. 2008 and December 2010 was once every 6.38 days for a period of 4.93 hours. The crazy drive by governments everywhere towards the grossly over rated and hideously expensive and grossly inefficient wind power is one of the main reasons for the increasing fuel poverty being experienced by the poor and oldest particularly in the UK and other parts of Europe. As an un-named Australian Cabinet Minister has supposedly been quoted as saying “Alternative power generation is one of the most efficient ways of transferring wealth from the poor to the rich”. World-wide statistics on wind farm accidents are maintained by the Caithness Wind Farm Information Forum. Fires, collapse, blade failure – it’s all there. Fires are very frequent and impossible to put out. OK, the warmists had their picture of the polar bear on the shrinking ice flow. Now, we sceptics have our icon. Don’t work when its still, don’t work when it blows. But it makes crony capitalists money any way. Wind turbines that get taken out by wind. This was exactly the first thing that came to mind when someone posted a link in the UK media that a major winter storm was about to hit the UK. “There go to turbines” was, I think, my first thought. THIS is the primary argument against wind power (and solar). We can not have a power supply subject to having the generation capacity destroyed by bad weather. Sure, we are used to having distribution system damage due to weather and power lines can be repaired in relatively short order, but when the generation capacity is destroyed, we do not have a robust source of power for the country. 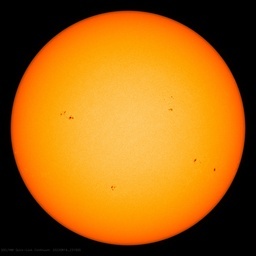 Solar is even worse in areas that regularly experience large damaging hail. Imagine making an investment for a solar generation infrastructure only to see it destroyed in a hail storm and have to be replaced … maybe every single year! Hope they have the equivalent of HazMat on scene, rare earth magnets release toxic fumes with temps above 350’ish. This is the main reason they cannot/should not be machined. FYI Dams are wind proof. “Federal energy regulators told the Bonneville Power Administration Wednesday that it can no longer discriminate against wind farm owners by cutting off their transmission during periods of excess electricity generation in the region. During last spring’s massive runoff, BPA adopted a policy of curtailing generation by wind farms in the region when there was too much power going into the grid, and substituting its own hydropower for free to satisfy those winds farms’ contracts with customers. Maybe they should design these things so they can be retracted into the ground when the wind gets too high. Climate Change proponents push the BS that we’ll have more frequent storms due to a rise of Co2, and we should pay millions extra on our utility bills to build more wind farms to help reduce Co2. Hmm… (scratches chin) they didn’t put too much thought into that argument! EU Referendum had a great idea: Solve climate change–burn wind turbines. Is the black pall of smoke, molten debris ejecta , and spray of transmission oil all part of ‘reducing our carbon foot prints’? Hmmmm???? How’s that working….. other than creating another hazardous waste clean up site? And potentially setting the surrounding countryside ablaze, with 160mph winds to drive the conflagration!!! Strange they cannot feather the blades….. Imagine a few thousand of these in dry forest or grassland in the southwest U.S. According to The Telegraph that melting windmill cost £2,000,000, thats about $3,000,000. £20,000 a metre! Coal fired plants which burn powdered coal, as in turbines, use a very explosive material-coal dust. Coal plants seem to be reasonably good at handling the danger, though. Why does the bad, bad wind hate the leftists so much? These things obviously get built to the same quality standard employed for IPCC reports. This morning when I heard there was going to be high winds in Scotland, I searched for live web cams of wind farms. No luck. I figured there would be windmill carnage and was hoping to watch. Wind speeds have been up to 165mph. Not 50mph. That’s stronger than “hurricane” Irene, but with less global media coverage because it wasn’t affecting the USA. I firmly suspect that the promoters of this type of energy production have very much under-estimated the maintenance costs. If some (and this may be only one) turbine is unable to cope with wind speeds of 50moh and collapsed as a consequence of encountering such wind force, then every turbine (or at any rate every turbine made by the same manufcturer and/or installed by the same installer) which has at any time (in the past and in the future if 50mph plus winds are experienced) will as a result of health and safety laws need to be inspected and certified safe. Should sometime in the future another turbine collapse and cause injury, the failure to carry out such an inspection would lead to legal liabilities against the windfarm and/or the suppliers of maintenance services and/or the designers and/or manufacturers of the windturbine. This liabilities could in extreme cases lead to a charge of corporate manslaughter should a death occur. I suspect that winds of 50mph are not uncommon and hence there will in future be a need for inspections to be carried out on a repeated basis, This will add to the costs of maintenance. Something which the tree hugging greens probably would not wish to promote. It’s probably the most energy a turbine has ever produced! There is something strange with that windmill. Apparently it is facing the wind backward. Look at the two other turbines and the direction of the burning/falling debris and the smoke. Was it stuck in that position and turning backwards? The greens will say that the cub was drowning due to the lack of ice and the papa bear was just helping it out the water. Has anyone tried a modified turbine ventilator, like those typically found on barns? Elongate the thing, say 60 feet tall and maybe three or four feet in diameter with the generator on the ground and a single structural member rising beside the blades to secure the other end of the axle at the top. The prospects of a last-minute deal on climate change have emerged at the UN talks in Durban, as the US threw its weight behind the European Union’s proposal for a roadmap towards a new global agreement. All eyes are now on China, the world’s biggest emitter of carbon dioxide, which has yet to back the proposal, and according to some insiders has been giving conflicting signals. Other big developing countries such as Brazil and South Africa have said they are willing to discuss the proposed programme, though India has rejected it. How long before you get a division by zero? Truly an Iconic picture of the ugly off-spring when science and politics(media) are married. Winds as high as 165mph were reported that day in Scotland with 70-80mph sustained in most populated areas. If you get hit by a 165mph wind you got a lot more than windmills to worry about as that will easily take the roof off a house. Roof and some walls torn off well constructed houses; trains overturned; most trees in fores uprooted. I didn’t see any adjacent damage, no debris, and am presuming the leaves were already off those trees in the background not blown off. However the tower was isolated and it still could have been a microburst or unreported twister. My pardons for the real ‘science’ still around. Vertical turbines were frequently discussed about 30 years ago. I haven’t heard much about them in recent years. Cost must be the reason. Right off hand. The winds are stronger aloft but a vertical turbine is best suited to winds just above the ground. Very tall ones would seem to need bracing not easily constructed for them. Nice show of observations skills, CSI Special Wind Crime Unit. Que theme tune. Yeeeaaaaahhh! Captain! We’re venting plasma from the port nacelle! Engineering, switch to Baseload Thorium Power! Engage! Make it so! The Europeans, aided and abetted by environmentalists, have been doing their best to shoot themselves in the foot since 2006. Fresh from their success in banning lead in auto gas, they decided to ban lead in solder. The result was a resurgence of the problem that led to the use of lead in solder in the first place: the growth of microscopic tin whiskers. Small but deadly for electronic circuits, these whiskers cause an unquantified decrease in the reliability of electronics employing lead-free solder. The problem is bad enough that lead solder is exempted from the legislation and is used in military electronics and medical equipment. Another eye-wateringly expensive burden ($32Bn + $3Bn annually) brought to you by environmentalists. Sad really when this accounts for only 2% of world lead consumption; batteries – 90% (http://en.wikipedia.org/wiki/Restriction_of_Hazardous_Substances_Directive). There are a great many vertical axis wind generators already on the market. Most settle for three or four blades rather than the Beehive design of barn ventilators. In the UK, the wind farm owner makes more money by taking the windmills offline during gales. Hence, green energy is indeed capitalistically sound – even factoring in the occasional windmill explosion – as long as you are the person who owns the windmills. It was a gust on top of one of Scotland’s highest mountains – Cairngorm. Not much to damage up there (ski lifts and funicular station/shop/restaurant). The UK’s equivalent of Mount Washington NH (highest gust 231mph). A looming turbine tower half as high as Beijing’s tallest skyscraper cast a long shadow over the Sinovel Wind manufacturing plant and a group of local government leaders recently before something went terribly wrong. Some say the October 10 accident at the Gansu Province plant that killed five people – including three local government officials and two Sinovel workers – was inevitable for a company that’s been growing too fast for its own good. Officials say the arm of the 1,000-ton crane built by Zoomlion Heavy Industries snapped and fell onto the entourage, which had gathered to watch the assembling of the tower with its 5-megawatt turbine and blades 100 meters in diameter. The dead included Yu Yongding, management committee director for the Jiuquan Industrial Park where the plant is located. Also killed were Yu’s his wife, who worked as a city government official, and a Yu subordinate. The cause of the accident has yet to be determined, and Sinovel Vice President Tao Gang told reporters that it’s unclear whether the crane’s mechanics or an operator played a role. In his opinion, the crane apparently lost its balance while hoisting the turbine onto the tower. the thing is that we were feeding power in to stop the damn thing rotating….! read the reports Dave Springer…debris was reported, un fortunately…this is a bad engineering failure…but winds of this speed only happen every year in this part of the world, Why did someone not let the engineers do something about this? That picture of the male polar bear eating a young polar has been blamed on warming forcing the bears to cannibalize, more doom and gloom. The alarmists conveniently left out the part nothing new here, normal behavior. Grizzlies will also do the same. Wouldn’t it be ironic if the insurance sector starts refusing cover to turbines that are exposed to wind because of the risk of damage. Fixed prices are socialist, not capitalist. Good grief, the storm is now heading for Denmark! What will happen with all its windfarms? Thanks, I’ve bookmarked that page (your work? because if so, I’d like to know the rate of accidents per turbine, is that increasing or decreasing, what is the cost of all these problems per turbine, and what percentage is that of the construction-and-running cost? Also it would be nice to see more graphically the real problems of intermittency. The Darius rotors (vertical) were the subject of a very long series of investigations by the NRC in Canada under Dr Peter South (for a long time). They have an inherent problem which is that the blades do not pull continuously. When a blade ‘at the back’ starts its swing forward it pulls harder and harder on the central column until 45 deg then it slacks off to zero when the blade is facing straight into the wind. At that point the opposite blade has been pulled from the front to the middle very hard with a sinusodial ‘yank’. This puts extreme stresses on the root of the blades. Adding bracing helps – usually two horizontal bars from one blade to the other. For the next 90 degrees of rotation, both blades pull quite hard but unequally, then the second one is at the back and starts it acceleration forward, forcing the first blade around from the front. The motion looks smooth but there are high stresses in them because of all the accelerations and swapping roles as puller, pulled, puller, pulled. In high winds the blade is parked edge-to-the-wind because the wind hitting the blade side-on can break them. The blade density is low and the tip seed high (6 to 7) so they make a LOT of noise. In a 50 kph wind the blade centre is going about 350. Even 3 metre ones are serious aircraft-level design works. The normal ‘fan mills’ are smoother though they still have the shadow of the tower creating a vibration as the blades lose thrust one after the other as they pass behind it. In 1982 a Canadian 3-metre aluminum rotor was placed in a wind tunnel in Pretoria, South Africa and the wind taken up to 100 kph. It did nothing. The operators called the researcher (who they refused to allow to help them ‘run it’ because he was only an ‘engineering’ prof) and laughed at him telling him he got ripped off – it was useless! He told them it was not self-starting – duh! Oh…. so they again ramped up the wind and gave it a spin. As they had no braking or load on it, it immediately spun up to a tip speed of about 650 kph within seconds and exploded taking out major pieces of the installation. Imagine if a 50 metre version had a brake failure! Windmills are great for pumping water and generating small amounts of power on light aircraft. Let’s hope that all the vanes blow off these windmills, the playthings of deranged believers in the Cult of Global Warming. A rather large roman candle. coal plants are a long since mature technology and don’t involve any explosive materials. I don’t know about that. I was once working at a coal plant where two units were down and I was heat-treating some welds on one of the generators. Meantime the generator next to me was having some repairs done on the hydrogen cooling system, and it turned out that the hydrogen in the lines hadn’t been properly purged and suddenly there was a boom and dust on the top of the generator jumped into the air. Luckily the explosion was contained inside the generator or I might have gotten hurt. I did return to that plant a few weeks later and there were some bent up baffles that were being replaced laying there. I suspect some operators had to take training in how to properly purge a hydrogen line after that. The 165mph gusts were in the peaks of the Cairngorms, some 100 miles North of Coldingham, where winds were forecast at 50mph. This was a truly feeble turbine. The usual high-wind failure modes of turbines are snapped pitch linkages and yaw system damage. In both cases, the wind exerts such a high force on either the blades or the Nacelle that it breaks something. Fires are usually caused by forcing the rotor to turn while the shaft brake is engaged – these things typically have several MNm of torque available, so no brake is going to hold it. So at a guess, the fire started with the wind breaking the pitch linkages, allowing the blades to go to fine pitch. The shaft brake was on because the turbine was parked, so once the blades started to lift, the brakes got hot and started a fire. The one that fell over is a bit harder to guess. Possibly since it wasn’t turned on yet it was not fully commissioned our even assembled. It also looks quite small. Windmills can’t stand the wind…. PRICELESS! I think someone at The Beeb has failed -not least because the hapless windmill actually managed to break itself really quite successfully. I’m guessing that was an electrical fire caused by either faulty components or bad switching from the control guys. Seems doubtful that friction caused it. This is not to take away from the humor of the image. Boss: So what could possibly go wrong with these things? Engineer: Well, with too much wind they could crash and burn. Boss: How often would that happen? Engineer: About once in every three to five years. Boss: Oh, heck, we’ll be out of business by then. Put em up! Wouldn’t this seem to be a weakness of wind power generators, placing them where there is the most wind? What was the total value of the capital destoryed by one windy day? The blades on the windmill failed to “feather”, and got caught producing lift in a high wind environment, the gear oil overheated and vaporized, leaving metal on metal gears, then things started melting. It was a failed control of the blade angle. Were they at least wind powered? Or did they leave a carbon footprint? No worries. Tax payers will pay for a new one. Cuz we are just that generous with our hard-earned coinage. Remember when we used to give to the old man with a cup at the corner? Just compare the thousands of parts , replacement and maintenance of 100 of these mills (a figure which should be multiplied by 39.53 – its avg.yield is only 2.53%) versus only one moving part 100 mw generator. Only bribery/foolishness explain its existence. Top of the news in Scotland is the $11billion it will cost to meet the SNP’s renewable target. In other words, the £2200/person or £10,000 for the average family. That is enough to rebuild each and every hospital. This stupid climate policy is just utter madness, particularly for Scotland which has nothing to loose and everything to gain from climate change. Even if the planet were to warm by 6C, Scotland will still not be warm enough for my liking. So to fight it, they want us to generate power from wind farms that turn out to be both inoperable during, and vulnerable to, extreme weather events. I know, biofuels! Of course, if extreme weather kills off crop production, we’ll have to make a choice between fuel and… food. On the off chance (way off) that we actually have a problem on our hands, why are they picking mitigation strategies that are worse than the problem? Cool. How are they rated for bird slicing? birds per hour? Do they normalize based on the size of the bird? Like if the rating is 4 birds per hour, does a duck count the same as a swallow? Or are they both “one”? And what about bird speed? Can a duck fly as fast as a swallow? An American swallow, or a European swallow? How should I know? With our enormous reserves, why would we need any alternative energy production in the U.S.? one day a wind turbine near the sea will be overloaded by wind and the blades will come flying off and impale an endangered species of whale or something. If I’m not mistaken, the “survival speeds” of the turbines assume that the blades have been turned so that they do not gain thrust/ force due to their positioning. I also assume the big windmills can change the angles of their blades. These fires are actually fairly commonplace. Often what happens is gearbox overheating sets the lubricant on fire or the brakes build up heat causing a fire. It is extremely rare for one of these turbines to last 5 or more years without overhaul of the gearbox. Ocean current turbines (as opposed to tidal turbines) would operate in a much steadier current and would not be subject to such vagaries of current velocity. Being in much denser fluid as well, they also can provide more power, even out of slower currents. Why hardly anyone is really doing anything with this I do not comprehend. These monstrosities on our open lands are a blight. Whoever thought these were a good idea must be the same people who thought using corn for fuel was a good idea. I still don’t know why people put so much blind faith in wind energy. Not to mention, the number of birds killed by them is far more then any oil or coal company that people love to demonize. IMHO, the picture at the top of the post looks hotter than an oil fire ?? Was Al Gore in town? They often contain a lot of magnesium to keep the weight down at the top of the tower. Ya know, if they threw in a diesel generator at the bottom of every one of those windmills, they could keep them running even when there was no wind…. My first impression was that someone was trying to make a windmill that actually worked, a coal-fired windmill. Here is a link to a burning wind turbine with lots of black smoke as the composite blades catch fire and burn off. Apparently this is quote common. Wonder how the Guardian would play these pictures after seeing the “black” steam from cooling towers or the black smoke coming out of a ship stack in Durban? Follow the link. Lots of photos. They have heating built-in to minimise/prevent icing, lubricant thickening and moisture damage. The cannibal isn’t really eating for hunger. It’s very common among many species for males to kill other males’ cubs. It causes Momma to go into estrus and be ready to start gestating his. Nature is often kinda violent with this Natural Selection thingy. vboring claims that coal fired power stations don’t handle explosive material. Wrong:- the coal is powdered and blown into the furnaces like a jet of gas, the most efficient way to burn the fuel. Powdered coal actually has more explosive energy than dynamite under the right conditions. It has caused more mine explosions than methane. Luckily coal fired power stations have old but reliable burning technology which has been refined over the years to be very safe for all concerned. And coal fired power stations do not blow over. 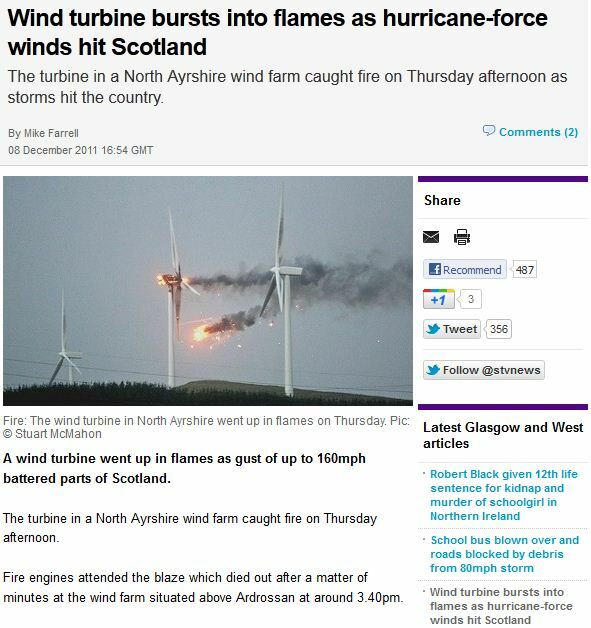 I don’t get what all the fuss is about over wind turbine fires in Scotland. I mean it’s not as if the landscape is covered in dense flammable heather with lots of remote and inaccessible areas with no guaranteed local water supply which are many miles away from the nearest town with a fire station which probably only has one fire engine anyway. No wait, I was thinking of somewhere else … that’s exactly what Scotland is like! Well, if you read the news properly, it was not due too the windstrenth because they were all the mills, meaning that they were not spinning. The blades are then turned in such a way that the wind cannot force them towards an other position. So waht was the cause? Some shortage in an elelctrical circuit like it can happen in all electrical devices, only it seems that they forgot the fuses? Is this a serious article trying to tell us that all wind farms are rubbish and dangerous and that coal mining and oil exploration is save? May be you can tell that to all those wives of al those thousands of mineworkers that died during there work. May be tell the relatives of all the people who died because of the blasts of gasterminals or during oil drilling activities? Wrong:- the coal is powdered and blown into the furnaces like a jet of gas, the most efficient way to burn the fuel. Powdered coal actually has more explosive energy than dynamite under the right conditions. Exactly. vboring is, well, very boring. Several times while I worked at a coal plant, there were plant-shaking “booms” as powdered coal/air exploded in the fuel pipes before entering the boiler. Everything from the pulverizers thru exhausters & to the boiler was overbuilt like a Sherman tank, so the boiler just went on running with no effect, other than shaking the place up. The only thing we did was identify the offending pulverizer, examine the coal/air pipes for damage (none) & let the pulverizer grind out completely (it only takes minutes) to make sure no possible sparks/flames remained in it. The boilers were built to withstand these events. Obvious failure due to climate change warming. This shouldn’t affect the capacity factor… will it? This wind turbine is an odd failure…..
No it is not. It is a largely UNPUBLICIZED failure. …Despite all that has been written about wind power, a vitally important issue has barely been mentioned. When turbines fail, blades may fall to the ground or send fragments that land up to a mile away. Turbines often catch fire, and when they do they often send flaming shards into fields and forests. Much has been said about the short-term jobs created in preparing turbine sites, but almost nothing about job losses from turbine-caused fires in our paper mills, sawmills and other forest-dependent industries. Official information on the number and severity of turbine-induced forest fires remains largely secret and unavailable. Nonetheless, there are scattered media reports and one thorough description of the safety record of the Caithness USA Wind corporation with installations in the northwest. That one corporation experienced 110 serious wind turbine fires over a 20 year period, but there is no mention of whether some of those fires may have spread to adjacent areas. Similarly, media references to 43 turbine fires, mostly in the U.S. and Europe, merely state “no details.” Many references do contain brief statements, such as that 22 fires were caused by lightning strikes, but again, no references to those fires spreading far from the sites. Only 25 of the reports mention that turbine fires had spread to fields and forests. In California, one such fire burned 68 acres, another 220 acres, and in Palm Springs several “spot fires” had been generated in surrounding areas. In Hawaii, 95 acres were burned. Australia lost 80,000 acres of forests located mostly in a national park. Spain lost nearly 200 acres from one fire. A comment on a German fire mentioned that “burning debris” from a turbine had traveled several hundred meters from the site. In Holland, three burning blades from a mere 270-foot tower cast a 50-foot flaming shard 220 feet from the site…..
Vertical turbines are less efficient than horizontal ones, but they do have a larger range of wind speed they operate in. With the weight of the turbine on the shaft, there are issues when you try to work on the motor. Dave Springer was obviously writing before the full report in the Daily Telegraph was available. There was at least one other wind turbine failure, as noted in later reports one of which Anthony has added to the original posting. Coldingham in the borders is not situated on top of a mountain Part of that broken windmill came down within a few yards of the road. Fortunately it hit no houses but some had to be evacuated. Winds of 160 mph are rare even in Scotland but winds of more than 60 mph are not, even in England. It turns out that the construction of a new UK offshore windfarm is being delayed by “Unseasonally” poor weather in the North Sea!! As we have had a remarkably mild end of year so far, I dread to think what would happen when a REAL North Sea gale blows up! I saw the turbine fire picture on your site yesterday and behold it appeared on BBC Newsnight here in the UK plus on the front of a popular UK daily paper . It reminded me of spectacullar pictures of World war II Battle of Britain aerial dogfights ( aeroplanes ) where things went up in smoke! Thank god things like nuclear power plants and coal-fired plants *NEVER* catch fire or have catastrophic failures. Duh. What is the point of stupid posts like this, Mr. Watts? It only makes you look desperate. Didn’t Willis show a graph in which the projected costs for wind power by 2016 were only slightly above coal? Seems that the story about wind power being expensive is either made up or is quickly becoming out of date as economies of scale kick in.